Late November, boat stocked up with provisions for a few months, all shore-based business finished and concluded for the foreseeable future, we were finally prepared, and ready, to go to sea. The hitherto unvisited- by us- Marquesas group of 8 islands roughly 900 NM northeast of here was the goal for the next 4-5 months with the rainy – aka cyclone- season officially started Nov 1. We were intent on making good use of an unusual weather window consisting of N to NW winds during 3-4 days making it possible to do some 300-400 miles of Easting though close on the wind. So far the plan, this window was supposed to take us as far as to Makemo in the central Tuamotus to stay there a few weeks then hopping along the atolls and finally the 400 or so miles to Fatu Hiva in the Marquesas. We left our mooring in the Baie de Phaeton very early one morning and were soon making good progress SE then due East around the southern tip of Tahiti. I was very pleased to notice that Nanna now makes significantly better course on the wind as well as speed. Very close to 6 knots of boat speed close-hauled at 45 degrees as long as the sea stayed reasonably flat. Happy with the decision to rid the boat of the Autohelm aux. rudder/windvane it has been sporting since way before I bought Nanna. ( it’s replaced by a normal servo-pendulum windvane, I found used locally) it’s like getting a new boat. More responsive, goes at least half a knot faster under sail and power since getting rid of the huge drag the old rudder/vane combo caused. 15-20 knots of Northerly wind with the 2 meters wave that creates plus the swell from NE of about one meter meets the always present SW swell of 1,5 meter. Add to it that these wave systems crash into the barrier reef and refracts from it and confused is just beginning to describe the sea state. This was only to be expected though, and wouldn’t last too many hours anyway, but diminishing as we put distance between us and the island. Unfortunately, when we soon did a routine check down below, we discovered that we were taking on some water at the bow of the boat when plunging down the steeper waves. Not a lot. You can bail out tons of water-literally- a day without being in danger on a boat, but even a few liters a day, as was the case, has a bad effect when ending up under the v-berth where we store lots of precious spares and God knows what else. So sailing on like this for days and weeks is a bad idea and would be very costly at the end, decision soon taken to turn back and fix this leak for good! A few words about this leak and the background to it. In the seven years we now sailed this boat, this was only the third occasion we went to windward in anything like bumpy seas. ( yes, that’s the reality of trade wind cruising) The first time was our 700 miles crossing of the Gulf of Panama, when we first discovered this leak. The second time, on two separate day sails, while returning to Tahiti from the leewards two years ago. About 250 miles hard on the wind. Still leaking a wee bit. My mistake was to assume it could only be because water found it’s way in through the hawse pipe on foredeck, where the chain goes through to the chain locker. Now I know this was just a part of it, which is fixed since a while. This time though, since the boat plunged 2-3 meters, bow downwards, into some steep waves, it was easy for Isabelle, equipped with a good headlamp, to see that the water came in at the stem head, port side, just next to the head stay fitting. So the good part of these bad news was that now, at long last, I knew how to remedy this problem once and for all! With that, we turned tail, 180 degree turn back to our home away from home. King Neptune was in a playful mood this lovely sunny day, about half an hour after turning, the wind died out suddenly and totally. After waiting a few minutes I fired up the engine, just for Neptune to send me a little surprise, I could see him grinning to my inner sight! A line of ripples on the water, half a mile ahead had us sailing again in minutes. Close hauled again! 15-20 knots but right on the nose! A few hours later we entered the lagoon at Vaiaro and dropped anchor in a favourite spot in 4 meters of turquoise water. First a couple hours on a beam reach SB tack followed by dead calm for half an hour, and then 15-20 knots SW(!) yes, Noetherlies forecasted! And mid afternoon the third shift to North, at last, and us being close hauled SB tack after the port tack. I couldn’t have gotten better “test conditions” had I dreamed them up myself. All good, leak totally subdued. Hopefully for good! We spent a week or so in the SE part of the lagoon before another daysail to Haapiti at the SW part of Moorea. This is Tahitis little sister island, and Haapiti their little version of Tahitis world famous surf spot, Tehuaupoo, also at the SW part of the island where the swells from the southern ocean provides the renown “tube” of this place. Writing these lines 29 December, we’ve been about a week in Haapiti enjoying what we love most, after sailing that is; swimming, snorkeling and free diving, now with addition of messing about in our inflatable kayak which has turned out to be a great instrument to explore shallow parts of the reef and shoreline too. Wet season here is even wetter than the so called dry season. Normally though, there is a few hours a day to play around on and in the water. And the water is WARM! As in 27-29 degree Celsius. As you may have figured, our plans – never written in stone- have been revised slightly. Again! From here, we’ll likely revisit the already loved, northern part of Moorea, before hopping to one or a few of the nearest Tuamotus atolls some 200-350 miles off to the north and northeast. The Marquesas won’t go anywhere anytime soon, and when we make the effort of moving our “house” there we’d like to have 6 months or so to really explore all or most of the islands. It is a slight gamble with the risk of a cyclone or tropical storm, though both FrPol and to some extent the SoC are usually saved from those monsters. A very Happy New Year to all faithful readers!!!! Ah, the leaking bow! What happened to it? One big reason I chose to buy Nanna, a Southern Cross 35’instead of the others we looked at, was the fact that the joint between the hull and the deck was entirely glassed together and bolted. Or so the broschure says at least. Why is this a big deal? Well, most production fibreglass boats are not. Most are only bolted with a sealant in the joint. 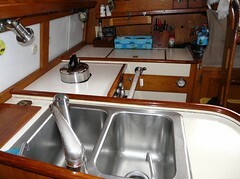 Over the lifetime of a boat, and especially if sailed extensively in swells and big seas ( as in ocean cruising) the hull and deck are flexing a wee bit ( especially on lightly built boats) which is known to cause mysterious and almost impossible to rectify leaks along this joint while at sea. Not a desired feature in my humble opinion. No doubt this is one reason some folks shy away from fibreglass construction and opt to go with metal hulls. Well, not all of those are welded all along the joint either, so due diligence is always a good measure…. If I had been more suspicious from the start, I would have discovered and repaired this one leak a lot earlier and saved some grey hairs and destroyed stores under the veeberth. No point weeping over lost milk. It turned out, for whatever reason that there was a 15 cm long gap, just aft of the stem fitting on port side with neither bolt or sealant, not to mention glass. It’s not quite clear to me why. Perhaps this was simply “forgotten” at the build, as a Friday afternoon- Monday morning event of sorts, or it’s of a later date. What I could see without doubt, is that there was some kind of putty, like thickened polyester that originally did the job. After all, the first owners of this boat, did a sabbatical through the south seas to Japan and back via Alaska to their home port in the San Fransisco Bay, and they likely did a few miles in mature seas on that trip. Anyway, this “putty” thing was cracked up and some pieces of it was gone altogether. To discover this it had to look hard at it from underneath the double bow roller SS plate. The repairs were done from the dinghy with thickened epoxy and strips of glass. Should be good for another 35 years! The repair took a couple hours in all, done in 15-20 minutes at a time in between the downpours we had during that week. 40 years of sailing and owning boats, I am still learning! 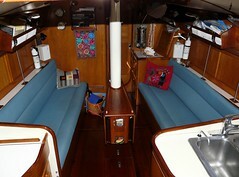 To get out sailing and exploring again after a three month long haul out and refit of Nanna. Very hard work. I stripped the bottom down to bare fibre glass after discovering a few smallish blisters, and decided I wanted to make sure everything. Was good. Well, long story short, she is now better than new, at least as far as the hull goes, with 6 coats of epoxy resin, two coats epoxy primer and a new topside paint with 3 coats of Two pot PU paint over 2 coats of epoxy primer. no need to ever worry about blisters or “osmosis” in the next 15-20 years. The hull was In fact dry as a bone thanks to an earlier epoxy job, as far as my knowledge goes, at least 15-17 years ago,so it was about time to redo it. In a week and a half, isabelle will be back from France, where she visited and supported her Mom (89 y o) who recently had a knee replacement surgery done. Then some provisioning and off we are to the Tuamotus. Then the plan is to try and use the weather patterns and use the shifting trades NE thru SE mostly, to make good the 1000 miles NE to the Marquesas group that we haven’t yet visited. The plan B, if it turns out too hard to beat to windward for that long, and the winds will have too much NE in them, to go SE instead and revisit Gambier at about the same distance from here. The Tuamotus will hopefully serve us as convenient stepping stones in getting there. The idea is then to return to our “home base” in Baie de Phaeton in late April or early May next year. Magnus is very keen on flying home to Sweden next year and spend a few months with family and friends, and of course also sail his little racer “Siska” the bright red H-boat ( 8,30 x 2.15 x 1.30 and 1,4 ton/ 25 m2) that he had so much fun in last year. Swimming that is. Our “private” pool is a about half a nautical mile long, studded with coral heads, fish aplenty, (though of baby size) and the water is 28-30 C so if I wanted to be a bit petulant I could say it’s slightly too warm in the pool ;-)….it is also without any maintenance obligations on our part, so simply put: Wonderful! On top of that it’s just some 4 miles out of our “home bay”, has a little dock on shore with a water tap that comes directly from a mountain spring and people gather here all day long to fill up their jugs and bottles since the tap water in their homes isn’t officially “potable” this offers plenty opportunities for encounters, some of them leading to visits, even forging friendships, and we are the only cruising boat anchored here. Unbelievable! Over the stern of our Nanna full view to south through west, so sunsets to enjoy each day. We’ve spent a few weeks here now, going back and forth for supplies, time online and some other insignificant tasks of mundane life. One swimming pass in the morning an one in the afternoon does very good for every muscle not to mention the cardiovascular stuff, mm. Today we had the added pleasure of a school of dolphins to keep us company, they were focused on their fishing though and didn’t pay us much attention. The pool is on the edge of the “platier” to the deep water in the lagoon. The depth between 1-2 mtrs and in the lagoon 15-30. The reason we see baby fish only? Well, the Tahitians are passionate about fishing, and the pressure simply seems too big for the lagoon fish since everything of “plate size” and upwards is harvested. 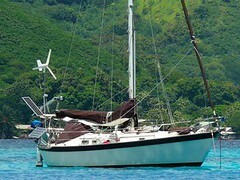 An interesting thing is that we hardly see another sail boat, and that’s in the main island of Tahiti but off season. Wonder if there are many more in May-September when the few hundred transient boats come through French Polynesia? I guess not, since we hardly ever see any coming down the southern or eastern part of the island. most go to Papeete, the Capitol, or to Marina Taina, 20 km south of there, get their repairs done, parts bought, and on they go, to Moorea or Huahine, a few days each, then Bora-Bora same thing and off they are fro the territory. Been there, ticked the box but seen nothing much of it?! It has been a long time since my last post. WordPress stats say 7 months and I have no reason to doubt that. this blog is about sailing ‘Nanna’ and since in fact we haven’t sailed her in over a year, there has been nothing to say or add. the much dreaded cyclone season, the latest one that is, officially now a new one is unfolding since about 3 weeks, was quite benign against all odds or predictions. the boat sat there, bobbing at the beefy morning I built and we mostly sat onboard. True, there were times with so much rain we almost felt like dolphins, but then in between there were weeks with very nice weather so in all we were just fine, and very pleased no cyclones came our way. Instead of cruising, we styled busy with other things. Isabelle finished yet another book, even got it edited and published, and there are always things to do on a boat. Isabelle in France, I had a 7 week joy trip singlehanding this boat all over the Stoxkholm archipelago, Åland, and Finland. Typically sitting at the helm and hiking between 6-12 hoiurs a day. It’s such a funnbpat to sail and for a design fr.o.m. The late sixties, she is a performer! Racer with a crew pf three, my modest 70 kg on the rail, meant a bit too much healing in anything over 12 knyts of wind. Despite that I amused myself overtaking 30-38 footers on a regular basis. The H-boat is 8,30 long, just over 2 mtr wide and weighs 1,4 tones with 25 square meters of sail. Add very low freeboard and you have a good sailboat, particularly to windward, where she points higher than almost anything else. Already looking forward to next time around…. Back to Tahiti. After those weeks in the Baltic Sea, I appreciate the climate here with renewed apprehension. Nanna is 32 years old now and there is a lot more “stuff” to break than on the Simple little H-boat. This has slowed us down a bit. Currently I am waiting for a new LPG ( cooking gas) regulator since the old one just lets enough flow to heat water for a morning coffee. It should arrive within a week…..I hope! Earlier on, there was some other little piece of gear that had to be ordered, fortunately I already forgot what! It never stops surprising me that every time something breaks, despite the myriad of spares we have onboard, it’s something that can’t be obtained but through ordering it from the “outside world”. Good thing it’s just those smallish bits and pieces, not too heavy or expensive. About a week ago upon starting the engine, I discovered no cooling water at all exited the exhaust. Long story short, had the raw water pump out, took it to the local mechanic and got two new lip seals ordered. Reinstalled the pump yesterday, but still no flow. Currently out of ideas, I will ask the mechanic to come over and trouble-shoot the raw water circuit, because I am unable to discover what’s wrong! What with the cyclone season? Nominally, it’s over. El Niño diminishing by the day and the consensus among metoffices is that later this year conditions will likely be neutral, or even a La Niña. All this means we spent these months on an exceptionally strong mooring for nothing. Though; better safe than sorry! In hindsight we would have preferred to be in the Marquesas group, but no one has a crystal ball to know what the future will be like. As far as sailing goes, nothing much to tell and the weather has been less than great though infinitely more agreeable than cold, windy winters in France or Sweden. We have had copious amounts of rain. So much that we had to wash every square inch of the boat exterioraly since green algae started growing everywhere and threatened to convert Nanna into a sculpture of slippery green. In between the rainy spells we’ve had fine sunny weather for a week or even two at a time. At the head of the bay where I built our mooring, there is rarely any wind so it’s been very hot onboard and in fact the rain always welcome as it cooled things off. Each time it rained for a few days at a time, we repeated the mantra; – lot better than a cyclone-, and filled our tanks, jugs and jerrycans with ‘eau de ciel’ as they say here, water for the sky. Apart from weather and daily checking of several meteo websites, we have enjoyed free wifi, for a change, albeit very slow. The big Carrefour supermarket a few hundred meters from the boat, making possible a more varied diet than when we are out on the islands.socializing with neighbors and friends and doing some odd little jobs on our boat. One morning a couple of weeks ago I discovered a shorted cell in one of the batteries onboard. Next week another so decided it was definitely time to replace them all. Two gelcell batteries available from a local supplier, and so far they seem very promising. Gel batteries accept charge much better then wet cells, and even better, they suffer less of “Peukert effect” meaning that on a gel after discharging say 10 Amphrs you’d have to charge with about 11,5 whereas on a flooded lead battery it would need about 12-13. Doesn’t sound like huge difference? Well. Over a year it makes a world of difference. Other advantage with gel is they do. It spill electrolyte even if lying on the side, they do not release explosive hydrogen gas as wet cels do, and they will normally live longer! The drawback is they are about twice the price, and need very precise charging procedures since water can not be topped up they must NEVER be overcharged. This strong El Niño year didnot bring a single cyclone into French Polynesia, not even to Samoa or Cook Islands, some 1000 miles west of us. Notwithstanding, TC Winston developed into a category 5 monster, killing over 40 people in Fiji and causing huge property and infrastructural damage. From our perspective, after living six months in Ecuador a little more than 3 years ago, the earthquake there recently was terrible news. We still not now exactly the extent of it in Bahia de Caraquez, where the boat was while we travelled the whole mountain chain in the interior, bit it is bad, unfortunately very bad news. Here again, during the entire season we never saw more than 30-35 knots of wind in squalls. This was while some mini-lows passed by. During heavy rainfall a few of the rivers on Tahiti flooded and washed away some houses but other than that, nothing much considering what was expected from a ‘bad niño year’. What’s next? -we hope to sail to windward a few days, to visit one of the closest of the atolls in the Tuamotus before flying back to Europe for a few weeks. Once back in “Fenua” the maohi name of this island country, we’d like to visit more of the Tuamotus, as stepping stones on the way to the Marquesas wher we’d like to spend next wet season beginning at the end of the year. It’s over three months since I last made a blog post. I have previously on several occasions mentioned that time flies, so I will not repeat it…but it does fly, and when I think back, there isn’t really that much of interest to mention. I ordered some odd little things for the boat. Some new zincs, impellers for the raw water pump and perhaps most important, a new charge controller for the solar panels. As usual, it took longer than expected for them to arrive and by the time it was installed, and we had replenished our supplies onboard,we were already late October, or even a few days into November. Officially the cyclone season starts here at Nov 1. Very strong El Niño year announced so a real risk of cyclones affecting French Polynesia. The plan was to sail to the Marquesas to spend the season there but just before deciding to go, we came across a book written about the history of cyclones in FrPol. The worst year, 1982-83, in modern times, no less than 6 cyclones hit Polynesia, and those who were around will never forget. The Tuamotus got badly hit, so did the Societies and the Australs. Marquesas, we always heard, never historically got hit. But, and it’s a big BUT, they do develop around the Marquesas, which means that tropical depressions, and tropical storms does occur in strong El Niño years even there. Most of our friends on boats around here who are mobile( harder for those who work, have children at school and so on) already had left by then. We reconsidered, and decided to spend the season here in Port Phaeton, rather than in marginal anchorages in the Marquesas. After all Port Phaeton is the best protected spot in all FrPol, so even if we will get hit by one, chances are better here to come out without serious damage. Time will tell, there is a slight flavor of Russian roulette over all this, but we can also take some comfort in that the area of FrPolynesia is as big as Europe, and cyclones are in fact quite small, rarely more than 350 NM across. Being some 100-150 miles from the eye, can make all the difference. As 30-35 knots of wind instead of 65+. Until now the season has been surprisingly tranquil. TC Ula touched the northern Vavau group in The Kingdom of Tonga a few days ago before turning SW passing south of Fiji where it has become more or less stationary and is expected to dissipate. Over here, days and even weeks of fine, sunny weather, followed by squally periods with heavy rainfall. Latest update on El Niño-related info, suggests that this event already peaked, but the risk is still high at least another couple of months, and particularly the coming two weeks or so in our area. Daily check on several weather sites each morning is the routine by now. Internet feels like an ultimate luxury after our 8-9 months in the ‘wilderness’ from Feb last year even if it is chronically slow. Apart from that, we’ve enjoyed seeing some old friends, and new ones too, in this our Polynesian Home Base. Boat projects are never absent, but the humid conditions this time of year makes it a slow process. If I can find a little corner of a roofed place, I consider building a new dinghy, in foam sandwich/epoxi using our current one as a mould, another possible idea would be a hard dodger/sprayhood, we’ll see how things unfold. I have constructed a hopefully hurricane proof mooring on and off the last few weeks, hoping to have it ready before needed. Otherwise, my preferred tactic, if a cyclone heads this way, is to go to sea 2-3 days before it’s arrival. Enough to get away200-300 NM from the eye. Problem is, the met office people say that the trajectory can be forecasted with an accuracy(statistically) of about 50 miles per day so it could be a close call in case the storm change course a couple of days away from here. This option is obviously not possible for all the people living on land, where the worst impact always comes from the heavy rainfall, causing landslides and inundations. Hopefully a (highly) possible cyclone will stay at sea and track between the island groups. The Tuamotus being low atolls, are of course most vulnerable even though they have shelters nowadays on the bigger ones built out of concrete. The last leg going back was an overnighter from Huahine to Tahiti. Hard on the wind for the duration of the trip but we made on one tack, and made good speed in 15-20 knots of wind. The forecast was for NE winds backing N then NW. This never happened, we had winds at ENE but our heading was about 110 degrees true, so it worked. Quite a wet ride, the only second time we had water sloshing over the side deck more or less continuously, the first time during the leg to Raiatea a couple weeks ago. Nothing broke and all is well. We’ve got some accumulated practical matters to tend to hear before continuing eastwards, probably within 2-3 weeks. Apologize for my latest post, at the last part ‘ going westward’ should obviously be Eastward and nothing else. As a bird flies we are 170 NM east northeast of Tahiti and nothing else. I should know the points of the compass by now…..no idea what i had on my mind as I wrote that. We’re still in Maupiti, such a lovely spot, but will likely start moving back east at the next good weather window. Regine, the sailmaker on Raiatea did an excellent job on our genoa, and after a couple of days of explorations on land, the climb of the highest peak on the NW part of the island being a highlight, we got a pretty good weather window for scooting westwards. Mainly thanks to our friends on ‘Parenth’ese’, who has been to Maupiti a couple times before we decided to go with the flow. Raiatea will still be there later on. So, right after breakfast we took off for Bora Bora, some 22 miles to the west. Nice downwind sailing in fine weather and we had the anchor dropped behind a motu just inside the only pass at lunchtime. The forecast predicted light winds and a diminishing swell – down to about a meter- tomorrow, but then the swell will quickly build to 2-3 mtrs, so no time to lose. We relaxed during the afternoon, taking a good look at Bora through the binoculars and then slept a few hours in the evening. Just before midnight we heaved anchor and took off for Maupiti, 28 miles further to the west. 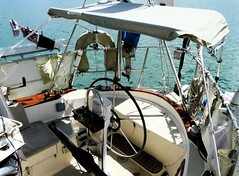 Wind just aft of port beam, full moon on top of us, we enjoyed one of these magical tropical nights at sea. The idea was to arrive just before dawn, to enter between 6 and 7 AM at low slack tide, and before the wind might pick up again. The only pass is open to south, narrow, and makes a dogleg between two motus before you’re inside the lagoon. There is always an outgoing current, but not too strong, so the only issue is the size of the swells. We circled just outside the pass for 20-30 minutes and it looked good, but it’s always harder to determine the state of the surf from behind, pitchpoling our dinghy on a beach landing in Mexico comes to mind…. Anyway Parenthese offered to go in first, a 50′ alu sloop with a lot more horsepower per ‘ ton of boat’ than Nanna has, so we saw them go in without problem and quickly followed. It was quite easy on the day, but it is a bit daunting with heavy surf both sides of the boat just a couple boat lengths away. We had already heard some horror stories, a few years ago a big catamaran ended up on the reef and even a ferry from Tahiti once. The key is to not negotiate the pass if the swells are over 1-1,5 mtr. Some folks we know arrived here in conditions where the entire pass is nothing but foam and surf, making it impossible. The options then are to chose another destination, or just wait at sea if the forecast suggests the swell might come down. Good visibility obviously helps, and even though it’s well marked and lit, entry at night are for daredevils or locals who do it on a daily basis. On a fast powerboat, it’s another story obviously, since you could ride a wave through the dangerous part of the pass. Writing this, we’ve been here for almost two weeks, enjoying this gem of a tropical island. Geologically the oldest of the Societies, just a few mtrs over 400 m for the highest peak, 1100 inhabitants, a shallow coral studded lagoon surrounded by loong motus it is very close to the ideal Paradise tropical island. We’ve climbed the mountains here again, a 7 hour trip, that took us down along a ridge on the opposite side, making it a complete tour of the island. Spectacular view from the top, it took some ropes to ascend the steepest parts, and a good machete to clear an old, rarely used path downhill. Apart from that we’ve watched yet some more of dancing, singing, and all of those Polynesian sports. The wind has been from due south for a few days, and it’s significantly colder than for many years in this -supposedly strong El Niño year- several of the locals say it’s exceptionally cold. They, and we too, had to dig out long pants and sweaters or jackets for the evening shows. Tomorrow the swell is to be over 3 mtrs, so we’ll enjoy being ‘trapped in Paradise’ for a while longer before it’s time to start going back westwards. The transient boats are mostly gone now, we still here some on the VHF, at Bora Bora, and the rest of us, who’ll spend hurricane season in either Marquesas or the Gambiers, will have to backtrack for a few weeks to come. Not too bad, plenty of nice spots to revisit on the way, to make passages during the most favorable conditions.